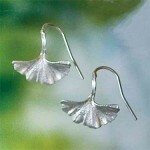 Delicate and graceful, these small ginkgo earrings show the elegance and grace of the ancient Ginkgo tree. Silver over cast bronze. Proudly made in the USA.